Flexing their muscles and showing off their fitness are, from left, Brian Clocksin, Jackie Doud, and Ryan Harrison. 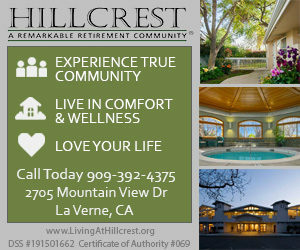 LA VERNE, California, October 15, 2017 — Now, you expect Hillcrest, which offers outstanding residential, lifestyle, dining and cultural opportunities year-round, to be a hallmark retirement center in La Verne for seniors, but a cutting-edge research center, as well? That’s the latest, we’re hearing from Ryan Harrison, Hillcrest’s Director of Resident Life & Wellness, who helped launch a study on a new fitness device — the DoubleFlex — that can offer unique wellness benefits for older adults. The now completed 12-week research and study project, conducted in conjunction with the University of La Verne’s (ULV) Kinesiology Department, chaired by Dr. Biran Clocksin, was so successful that it has been accepted by the prestigious Journal of Exercise Science, with an expected publication in early 2018. How the study was launched is an amazing story in itself. Harrison, a self-described fitness gadget guru, was surfing the internet one day when he came across a new fitness product called the DoubleFlex, which was invented by Paul Francis to help combat muscle and bone loss in space. Although weighing less than three pounds, the exercise device can increase contracting and expanding tension up to 25 pounds, using proprietary SpiraFlex packs or disks that are a lot safer and more convenient than swapping out dumbell weights. Intrigued, Harrison ordered one and after it arrived, he couldn’t put it down. “I couldn’t stop playing with it,” Harrison said. That was, until it broke, after which he called the company to order a replacement. When the new one arrived, it came with the DoubleFlex CEO’s business card. 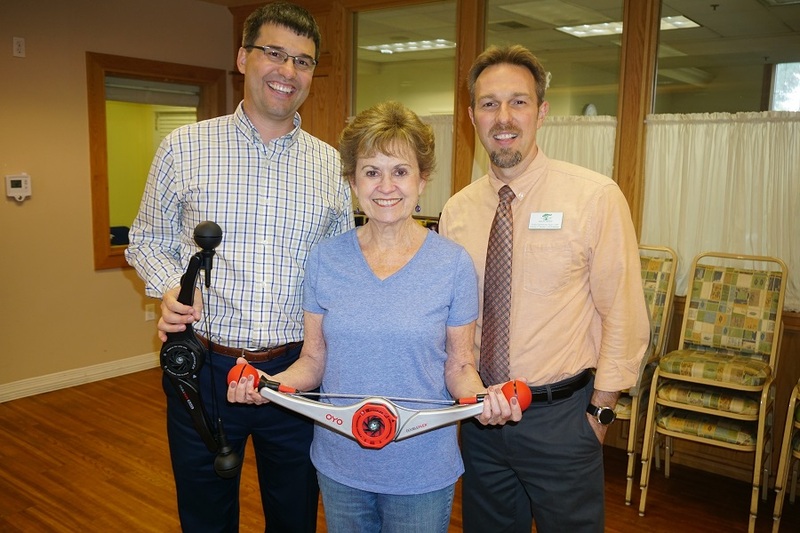 Harrison called up CEO Francis and pitched him the idea of creating a DoubleFlex class exclusively for older adults and and building a scientific study and instructional manual around it that would record the results that the participants received. “It was a novel tool that was ripe to have a study done on it,” Harrison said. It was an offer Francis couldn’t refuse. Francis sent Harrison 32 DoubleFlexes free of charge so he could conduct his class and study. Afraid of over-promising and under-delivering, Harrison immediately sent out a plea for help to ULV’s Kinesiology Department upon which Clarkson said he was all in. The two collaborated in designing a class that would recruit Hillcrest residents as the study participants and ULV kinesiology and physical therapy students as the data collectors. Harrison had a fairly easy time recruiting students for the project. He appealed to their self-interest. Once they had the study’s controls in place and the data collectors and participants lined up, the twice-a-week, 45-minute sessions began. One of the study’s participants was Hillcrest resident Jackie Doud. As an incentive, students not only got to share in the personal health results they achieved, but they got to keep their DoubleFlex. There was a significant increase in handgrip strength, which research has shown is correlated with greater functional ability, greater physical activity levels, better cardiovascular health, less fraility, less short-term mortality risk, and reduced prevalence of metabolic syndrome. There was improvement in the Up & Go-timed mobility test, from 39 percent meeting suggested scores to 71 percent. This is correlated with improved executive function and mental flexibility, as well as lower risk of falling. 68 percent reported feeling stronger. One think Harrison hasn’t had to think about is expanding the number of DoubleFlex classes Hillcrest wants to offer, including a free introductory class for interested La Verne residents. Meanwhile, DoubleFlex has come out with a new and improved version that can withstand all of the uses and positions Harrison puts it through. And with its new folding feature, Harrison even packs it in his suitcase when he travels. If you would like to participate in an introductory DoubleFlex class, call Hillcrest at 909.392.4029. Space is limited.